Donna Leon is an American teacher who lives in Venice and has, over the past 20 years or so, written 20 crime novels set in the city, as well as a book about animals in Handel’s operas. Leon’s hero is Commissario Guido Brunetti, a native Venetian policeman, who is ably assisted by his friend, Ispettore Lorenzo Vianello and the formidably glamorous Signorina Elettra, and generally hindered by his boss, the slippery Vice-Questore Patta, and his brutish side-kick, Lieutenant Scarpa. The Brunetti novels are fairly formulaic, although none the worse for that. There will, of course, be at least one murder, which Patta will either not want Brunetti to be assigned to or will want cleared up or brushed under the carpet very quickly for political or personal reasons. There will generally be a theme of corruption, either the endemic corruption of the Italian state system or more specific business or personal shadiness. The decaying splendour of Venice and life in that unique city always features heavily. A Question of Belief is the 19th instalment in the series. It is a hot and sweltering August in La Serenissima. Brunetti and his family are planning their summer getaway to the mountains, with Brunetti delighting in the fact that he will need to take a sweater with him. Before he goes, however, Vianello asks him for some help dealing with his aunt, a usually sensible woman who has begun to give large sums of money to a fortune teller of dubious morals. At the same time, an acquaintance comes to Brunetti with concerns about the conduct of a judge in the Venetian court and one of the senior clerks of the court. After some preliminary investigative work, Brunetti is on the train north to join his family on holiday when he gets a call. The clerk, a Signor Fontana, has been found murdered. Brunetti must return to the city to crack the case and help Vianello. Where A Question of Belief does slightly differ from other Brunetti novels is in the extremely relaxed pace. The first murder does not take place until nearly halfway through the book and up until then, it is a slow ramble through the hot summer. In some ways, however, it is comfortingly like the rest of the series. There is no clean ending, as is often the case with Leon, who does not lean towards the neat solutions of many crime novels. The criminal does not always get punished; indeed, sometimes the criminal can look more moral than the authorities. In many ways, she has a fairly harsh view of the Italian system and, were it not for what, in my opinion, is the greatest strength of these books, they would begin to resemble Michael Dibdin’s Zen novels far more closely. It is instructive that Leon’s books have been translated into 20 languages but, at her request, never into Italian. I suspect she does not want her adopted countrymen to see the force of her criticism. Where Leon really stands out for me is in the portrayal of Brunetti’s family life – in some ways, the books are almost portrayals of a Venetian family, interspersed with a few crimes. Brunetti is happily married to Paola, a professor of English literature at the university and has two loving – and lovable – children, Raffi and Chiara. Pick up any of the Brunetti stories and the most enjoyable sections will be those set in the family apartment, especially at mealtimes. It may just be that I am a greedy pig but the descriptions of the Venetian meals that Paola makes are mouthwatering. There is actually a Venetian cookbook called A Taste of Venice: At Table with Brunetti, featuring extracts from the novels with the accompanying recipes. It has an honoured space in my kitchen bookcase. Having said that Leon’s books are formulaic, I want to emphasise that, in this case, it is not a criticism. There is a comforting elegance to Leon’s writing and each time I pick one up, I look forward to reading more about the Brunettis. There are only two minor criticisms I have. Firstly, it seems as if Leon is struggling to adapt to the passing of time when it comes to Brunetti’s children. They are important characters in the series but are growing up rapidly and I don’t think Leon really knows what to do with them. The result of this is that they are starting to disappear from the narrative, which is a shame. The other minor beef I have is that Signorina Elettra is becoming too much of a deus ex machina for Brunetti and Vianello. Her role as information gatherer and administrative trouble shooter has grown over the series but seems to be turning into an easy and lazy way out for Leon. Less Elettra, please, in future. These are quibbles, however, and, although A Question of Belief is not my favourite Brunetti, it was still very enjoyable and I look forward to the next book coming out in paperback. If you are new to Leon, however, like the King of Hearts in Alice in Wonderland, I recommend that you begin at the beginning with Death at La Fenice. 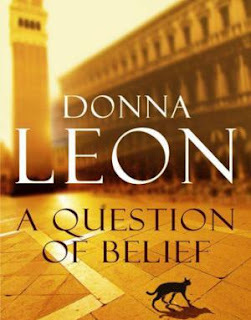 When I was planning my trip to Venice - meaning, i was planning the books to read about it - I came across Donna Leon several times. I ended up going for one Classic (Wings of the Dove) and one graphic novel (Pratt's Fables of Venice). I like how you described the book. Without being a cosy mystery, it could become a cosy read when you need a bit of detective-ing. I have had very mixed reactions to Donna Leon's books. I read one that was terrible (don't remember the title, but the villain was a powerful secret society there was no way anyone could beat or expose and the killer was insane - two plot elements I absolutely detest) and then another one I enjoyed but had several issues with. The descriptions of the Brunetti family life and food are always lovely, whatever one might say about the criminal side of the plot. Alex - good summing up of it, I think! Bibliophile - I agree that they can be variable and this one is probably not the place to start but, these days, I read them more for the family and food scenes than the actual crime!